With big name companies and brands getting into the home automation industry, the technology has hit the mainstream population. Just last week, Nest bought DropCam for $555 million. Apple announced that they will be releasing a new technology, known as HomeKit, sometime this fall. Google also has plans to get involved in home automation. With so many big companies, it is no surprise that there are other competitors out there racing to provide the best product. 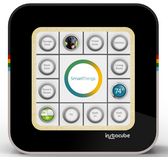 SmartThings has launched their own product, known as IFTTT, that will allow users to set up their own rules to automate patterned actions across various smart devices and applications. “IFTTT” means, “if this then that”, and is the launching pad for home automation. Having many different products and systems working together to make home-life easier and more efficient is where home automation is going. If you are concerned that the last person to leave the house will leave the lights on you can, from your phone app, tell your Philips Hue lights to “turn off”. IFTTT lets the user set rules for repeated actions on a variety of devices. Users can create connections between Philips Hue, Withings, Netatmo Weather Station, SmartThings, Wink, GE and Quirky just to name a few. With all of these being able to work together the applications are endless.